Hyundai’s Elantra GT receives an update for 2017 in the form of available Apple CarPlay and Android Auto, which is a boon for connectivity buffs of the two major stripes. Those still clinging desperately to Palm OS will invariably be more interested in the GT’s new Value Edition package. 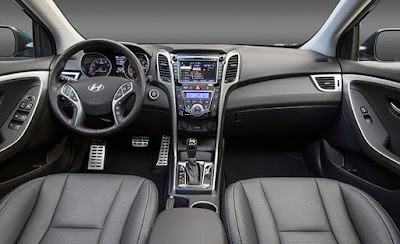 Consisting of leather seats, steering wheel cover, and shift knob; key-less entry with push-button start; fog lights; a power driver’s seat; automatic headlights; 17-inch wheels; an auto-up driver’s window; heated front chairs; and a sliding armrest; Hyundai pegs the Value package’s—ahem—value at $2650, but they’ll only charge you, the sharp and frugal consumer, $1650 for the pleasure. While a manual-equipped Elantra GT starts at $19,635 and an automatic-equipped version is $20,635, the Value Edition (automatic only) will run you $22,285. The price difference won’t buy a whole bunch of contract-free, state-of-the-art smartphones, so why not treat yourself to some heated seats? You’ve stuck with Palm so long, why not wait another year to upgrade? 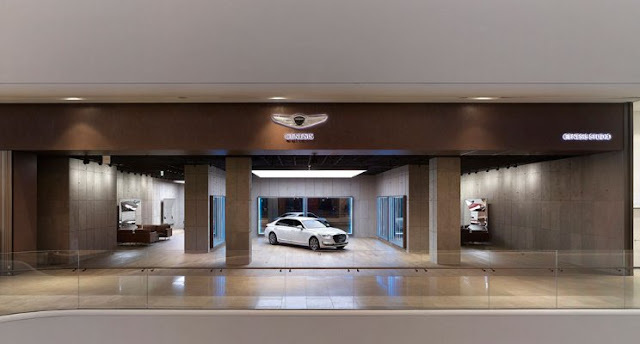 Genesis, the luxury automotive brand, will open its first dedicated brand space inside a newly built cultural complex ‘Starfield’ in Hanam, 30km east of Seoul on September 9. The Genesis Studio embodies the brand directions of Genesis and its core characteristics. Being located in the high traffic area, the space is expected to attract lots of visitors, evoking their curiosity around the brand. “We are very excited to open the Genesis brand’s first dedicated brand space, Genesis Studio. Visitors can easily drop by the Studio, and get a chance to know about Genesis. This space, located in a busy area, will serve to introduce our brand, and to raise visitors’ curiosity around it. We have also developed diverse concepts of brand spaces that fit for different objectives, so you will see more exciting brand spaces to come in the near future,” said Manfred Fitzgerald, Head of the Genesis brand. As a design-focused brand, Genesis focuses on making the space embrace the brand’s unique design directions. Located on the second floor of the complex, the Genesis Studio will host the range-topping G90 limousine, G80, and G80 Sport. In particular, visitors can have an opportunity to experience the G80 Sport ahead of its official launch scheduled later this year in Korea. Visitors will also experience the luxury and attention to detail of the materials and technologies through hands-on exhibits. For example, the doors of the G80 and G90 are displayed in Genesis Studio in all available combinations of exquisite exterior colors and artisan interior materials. Moreover, the Genesis Studio provides a one-stop, stress-free customer experience where brand experience, test drives, purchases and consultation are conveniently offered to each customer. Genesis experts will deliver interesting stories and values behind the Genesis brand along with detailed information on Genesis vehicles. Visitors can also experience the comfortable yet dynamic driving performance of the Genesis range by test driving the vehicles, even at high speeds, on a range of specially-planned routes. Starting from Genesis Studio in Hanam, Genesis plans to open diverse concepts of brand spaces in major markets. As the first dedicated brand space for Genesis, the site in Hanam will inspire other Genesis brand spaces around the world. Following the flagship G90 and G80, its variant G80 Sport, which was unveiled at the 2016 Busan International Motor Show in early June, will start selling in Korea later this year. With the launch of G70 scheduled next year, the Genesis brand’s fascinating product line-up will keep expanding. Hyundai has updated the Elantra GT for the 2017 model year by giving the hatchback a host of new infotainment technologies and an additional styling package. For starters, the infotainment system of the 2017 Elantra GT now supports both Android Auto and Apple CarPlay, allowing owners the ability to easily sync up their smartphone to the vehicle's screen. This new features comes within the Tech Package which also includes a rear-view camera, navigation system, cooling front seats and dual-zone climate control. Also for 2017, the new Value Edition package joins the line-up. Priced at $1,650, it adds a selection of new interior and exterior features. Most significantly, the Value Edition adds 17-inch alloy wheels, automatic headlights and a set of fog lights. Additionally, the package includes a leather wrapped steering wheel and shift knob, heated leather seats as well as a sliding armrest. There's also an auto-up driver's power window, push button start and a proximity key. While all of these features were previously available separately on the 2016 model, combining them into one package saves the customer $1,000. Elsewhere, everything about the 2017 car remains the same as the outgoing model. That means the GT continues to be powered by a 2.0-liter four-cylinder engine delivering 173 hp at 6,500 rpm and 154 lb-ft of torque at 4,700 rpm. Mated to this engine is either a six-speed manual or six-speed automatic transmission. The Hyundai H350 Fuel Cell Concept, revealed at the IAA Commercial Vehicle Show in Hanover, is designed to prove that fuel cell technology can be adapted to the commercial sector as well as for passenger cars. The van is equipped with a 175-litre hydrogen tank that can be refilled from empty in four minutes, which Hyundai says makes it a more viable alternative to slow-charging electric vehicles for commercial operators. The H350's electric motor produces 100kW and 300Nm, and Hyundai claims the van will clip a 150km/h top speed and will run for 422km before requiring refuelling. Equally important, the hydrogen-powered powertrain has no impact on cargo space, with the short wheelbase version of the H350 providing 10.5 cubic metres of space, which increases to 12.9 cubic metres in the long wheelbase variant. 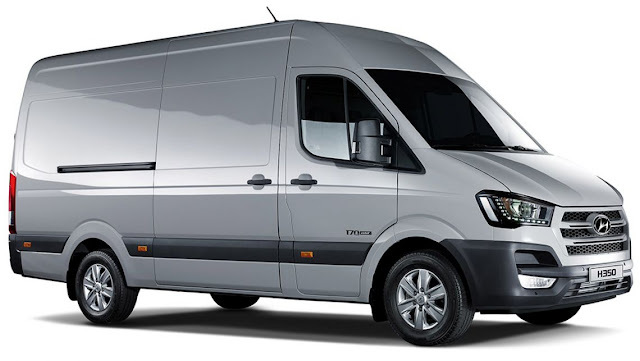 While there's no immediate production plan for the H350, commercial vehicles are the next logical step for Hyundai, with the company already heavily invested in the passenger vehicle segment. This unveiling follows news last month that the Korean manufacturer will offer the first commercially available hydrogen-powered cars in Australia within two years. The ACT Government has already lodged the first-ever order for 20 yet-to-be-revealed Hyundai Fuel Cell Electric vehicles, due to be delivered in 2018. "The H350 is designed to show that you can have a zero-emission commercial fleet with a long range and very quick and practical refuelling times," says Hyundai Australia PR boss Bill Thomas. "If you had a centralised refuelling point, you could run a fleet like this easily. It gives you the performance of regular van, but with the quietness and zero emissions of a fuel cell vehicle." The H350's unveiling follows the reveal of the Mercedes-Benz Vision Van earlier this month - a futuristic commercial vehicle that paints an electric, rather than fuel cell-powered, picture of the future. The all-electric Vision Van is powered by a 75kW electric motor and can stretch to 270km between charges. While parts of the concept seem a way off (the cargo area is fully automated and it comes equipped with delivery drones that launch from its roof), the electric technology powering it is available now. Your writer has a special relationship with the last-generation Hyundai Elantra. On a test drive of the then-new model a few years back, I discovered a car with many strengths and few weaknesses. The ride quality on rough, real-world roads stood out; the Elantra felt durable, dense, and robust. Feature content was excellent, while styling was upscale and unique. The ABS and stability control systems performed consistently well, discreetly, and with refinement during a week of nasty winter driving ― adding confidence to my travels. Fast forward a few years. My mother needed a new car to replace her trusty but ageing Honda Accord; she wanted a used Civic, but had a budget in mind. And although all mom wants from her car is to know that it exists, she decided that she’d treat herself to heated leather seats in her new ride. Furthermore, I decided that I wanted mom to have stability control, which made both of us more confident about her travelling around in the snow. These features weren’t possible in a used Civic in her price range. Instead, she’d have to settle for a basic unit with cloth seats (non-heated), no stability control, and limited options. However, the same money would also get my mother into a few-year-newer Elantra equipped with stability control, more amenities, and her mandatory heated leather seats. With my blessing, she’s owned a last-generation Elantra for several years now. I know the car well. So, on a recent test drive of the all-new-for-2017 Hyundai Elantra, I noted that Hyundai has taken a compelling car and made it even better. If you’re a driver of a previous Elantra and considering upgrading into the new one, here’s a look at some of the stand-out differences — and where you might most see and feel the latest Elantra’s further-improved quality. It starts outside: The bulbous and curvaceous bodywork has been benched in favour of a look that’s cleaner, tidier, more angular, and more upscale. The front fascia is a collection of straight lines and sculpts, accented with chrome and LED lighting and set against a chiseled hood. The rear is cleaner, more assertive, and more detailed, although the proportions of the taillamps to the trunklid to the rear bumper still instantly define this machine. 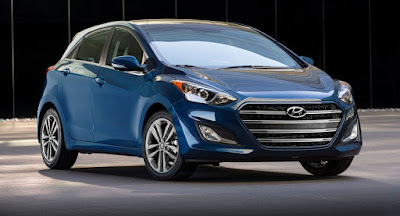 In all, the Hyundai Elantra’s look is more alert and more sophisticated, and styling now pulls its weight even harder towards the Elantra’s price tag. Pay attention, and you’ll see tighter panel gaps, reduced tolerances, and more precision in the details, too. Hop on board, and the Elantra’s most valuable asset surrounds you. The cabin is the biggest step forward here, in terms of both design and execution. The former Elantra was unconventional looking, with accenting that was curvaceous, radically shaped console trim, a unique but fussy climate control layout, and crispy, hard plastic dispatched widely as the trim material of choice. By contrast, the new 2017 Hyundai Elantra feels just like a slightly smaller Hyundai Sonata, which is a good thing. Styling is blessedly conventional. The lines are clean and uncluttered. Effective use of trim, accents, colours, and textures throughout give the forward dash a rich and upscale appearance, with some details and materials that wouldn’t look out of place in a thrice-the-price luxury sedan not so long ago. And it’s all sensible, easily operated, and upscale. The infotainment interface is one of the most logical and responsive in the segment, two supplemental digital displays for climate control and the driver computer add a touch of high-tech flair, and the materials and build quality are all improved, as well. This new cabin stands up nicely, even to close visual inspection. So, if you want a compact-car interior that’s easy to use, conventionally laid out, and delightfully styled and trimmed and detailed, right down to the tactile feel of the buttons and switches, you’ll like what’s happening here. Further improvements are apparent in the drive. Ride quality is bang on: well managed, calibrated for comfort first and sportiness second, but without feeling like a motorized glob of mayonnaise. On my watch, the 2017 Hyundai Elantra proved free of undue noise or excessive activity from the suspension, even on the roughest roads I could find to hammer on the springy stuff beneath. Driven thusly, the steering system stays straight and true, with no tugging from the wheel and no harshness transmitted through it. Like the former Elantra, the new model feels dense, durable, and solid on rough roads, not delicate and flimsy and as if the suspension is disintegrating beneath you like dollar-store toilet paper. 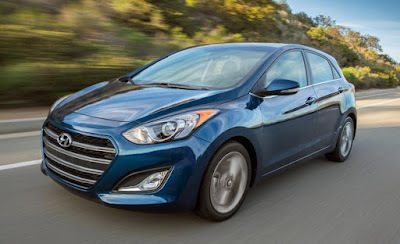 The ride is similar, but quieter, and the overall feel between the two generations is in the same ballpark, with the newer Elantra coming across as more fine-tuned, more substantial, and better calibrated more of the time. A few complaints do surface, however. The big one is noise: The 2017 Hyundai Elantra isn’t excessively loud at highway speeds and beyond, where noise levels are about average for the segment, but given the luxurious look of the cabin, some drivers will expect less wind and road noise to seep in as speeds increase. Moreover, the new powertrain is most impressive when driven gently, and numerous competitors offer a more pleasing sound and refined sensation when called upon for full-throttle exercises. Speaking of competitors, the new Honda Civic feels sportier, with a driving position that’s lower and more coupe-like, steering that’s sharper, heavier, and more entertaining, plus a suspension calibration that’s tauter and more eager in hard driving ― though at the slight expense of ride quality on harsher pavement. The Mazda 3’s interior is less tidy and straightforward, but even richer with detail and texture, and slightly more high-tech in execution. It’s also got a more refined driveline. The Toyota Corolla has a significantly superior lighting system with standard LED headlamps, and it feels a touch roomier inside, especially in the rear passenger quarters. Ultimately, the 2017 Hyundai Elantra’s noise levels at speed may disappoint slightly, but overall, here’s a machine that puts top-notch, real-world ride quality on offer, from a cabin that punches above its weight, wrapped in a great new look, and all that at a price that won’t break the bank. For shoppers, it should be considered a priority test drive in the segment. FOUNTAIN VALLEY, Calif., Aug. 24, 2016 – Hyundai is debuting a new mobile app for owners called MyHyundai with Blue Link. The new app integrates services currently available in the previously separate Blue Link and Car Care mobile apps. This MyHyundai app makes it even easier for customers to access Blue Link remote start, schedule service, get vehicle diagnostics and view how-to videos similar to how they can use the MyHyundai.com owner website. It will have additional features in the future. Compatible with smartphones and tablets, the MyHyundai app is available for free download on Google Play and the Apple App Store. The inclusion of Blue Link remote and Assurance Car Care features into the MyHyundai makes vehicle management and ownership seamless. Currently, owners can manage their Blue Link account, along with tracking vehicle service history, scheduling maintenance and checking vehicle information on MyHyundai.com. To access the full set of app features, users will need to activate their Blue Link service with the remote package. Customers without a current Blue Link subscription can get a demonstration of the Blue Link remote features inside the MyHyundai app. Hyundai Blue LinkBlue Link brings unified connectivity directly into the car with technology like Remote Start with Climate Control, Destination Search powered by Google®, Remote Door Lock/Unlock, Car Finder, Enhanced Roadside Assistance, and Stolen Vehicle Recovery. Blue Link can be easily accessed from the buttons on the rearview mirror, the Web or via the MyHyundai app. Some of these features can even be controlled via the latest Android Wear™ and new Apple Watch™ smartwatch offerings. Hyundai Assurance Car CareCustomers can use the car care features found in the MyHyundai app to conveniently schedule an oil change at their favorite dealership or access their Hyundai’s interactive owner’s manual that provides owners a convenient, simpler way to become familiar with the full capabilities of the vehicle. The MyHyundai app also has quick reference guides and maintenance and recall reminders. Hyundai is showing that automakers don't have to bash rivals in order to make their own products look better. In four unconventional spots released in late August, Hyundai admits that its competitors are indeed churning out "good" vehicles. The Ford Edge and Escape? Good. But Hyundai marketing boss Dean Evans says a conquest-minded Hyundai wants to hammer home the point that its lineup is "better" -- even if the brand is doing so in a way that's a little friendlier than the industry is used to seeing. While Hyundai highlights various features such as Android Auto and emergency braking that competing models don't have, it stays away from the confrontational stance that consumers saw in June, when Chevrolet openly questioned the toughness of the Ford F-150's aluminum bed. Hyundai went with a humorous touch instead by putting rival vehicles in precarious situations, including one Sonata spot that shows a Camry on a conveyor being slowly ushered to a huge grinder as a terrified occupant sits inside. Amid the confusion, Hyundai works in time to push the Sonata's Android Auto and panoramic sunroof -- features the Camry doesn't have. Each ad begins with the "Good or Better" banner on the screen. The spots mark the latest phase of Hyundai's "Better Drives Us" campaign that began last year. "It was built that way not to say "others aren't good,' but just to remind consumers that Hyundai has been striving for years to be better value, better technology, better safety," Evans told Automotive News. "We thought the best approach in the marketplace was to come up with that friendly approach and still get our point across," he added. "I think at the end of the day, it also kept Ford and everyone else from writing us nasty letters." Evans said the campaign started as a Tier 2 effort, but Hyundai has since bought national ad time for it. He said millennials likely will respond more favorably to the humor, but he's hoping to reel in any in-market buyer. The spots center on the Elantra, Sonata, Santa Fe Sport and Tucson, with each one putting competing models in perilous situations. The Tucson spot, for instance, indicates that the Escape's fueling and routine repair costs are higher than those of Hyundai's compact crossover. As these details are revealed, a huge magnet scoops up the Escape while a man in the driver's seat screams for his life. Hyundai's marketing team went into the campaign wanting to beat up the competition, but they understood that they couldn't really crush or drop a vehicle because of legalities. So Evans said the enormous grinder, the magnet and a catapult were used as symbols for comedic effect, and no one gets hurt. "You can't disparage other people's products. Networks don't want to run it, you get nasty letters, and I do think there is some illegalness to it at some levels," Evans said, adding: "Right before you think something's going to happen, it's not, and that's the gag." FOUNTAIN VALLEY, Calif., Sept. 12, 2016 – Sonata Hybrid receives a number of audio and multimedia enhancements for 2017, including a larger seven-inch high-resolution color touchscreen display audio, standard HD radio, Apple CarPlay, Android Auto and next-generation Blue Link. Sonata Hybrid is built at Hyundai’s Asan, South Korea assembly plant. The heart of the 2017 Sonata Hybrid is a 2.0-liter Nu GDI four-cylinder engine coupled with a six-speed automatic transmission that houses a powerful 38 kW electric motor and clutch where the torque converter would normally be found. Sonata Hybrid’s Transmission-Mounted Electrical Device (TMED) delivers the same responsive, engaging driving characteristics Sonata owners expect while improving fuel economy through the use of the larger electric motor. This innovative transmission uses an electric oil pump, which helps improve efficiency. 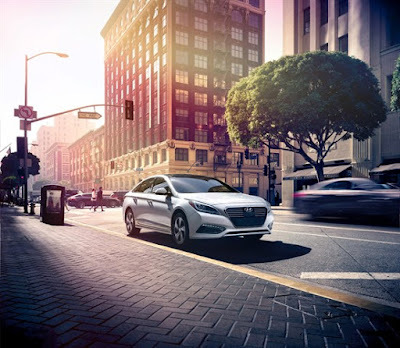 It is possible for Sonata Hybrid to operate solely on electric power at speeds up to 75 mph by decoupling the gasoline engine from the rest of the drivetrain. Sonata Hybrid’s Nu engine produces 154 horsepower and 140 lb. ft. of torque. The electric motor produces 38 kW (51 horsepower) and 151 lb. ft. of torque. Hybrid system net power is 193 horsepower at 6,000 rpm. Sonata Hybrid SE achieves an EPA-estimated 39 mpg in the city, 45 mpg on the highway and a combined EPA-estimated rating of 42 mpg. The Sonata Hybrid’s total estimated range is more than 650 miles under typical driving conditions. The lithium-ion polymer battery pack capacity is 1.62 kWh and the battery pack fits under the trunk floor, which allows for a flat trunk floor as well as available 60/40 split-folding rear seats. 2017 Sonata Hybrid offers best-in-class cargo volume at 13.3 cu. ft., thanks to the compact battery pack dimensions and efficient design. Locating the battery pack beneath the trunk floor helps improve cargo volume and total interior volume. DESIGN2017 Sonata Hybrid has an exceptionally low coefficient of drag of 0.24, the lowest in the industry. A distinctive instrument cluster with a 4.2-inch color LCD multi-purpose display provides Hybrid drivers with additional information about the hybrid system’s operation. Sonata Hybrid will offer an all-new color palette, with mid-model year availability, including Hyper White, Nocturne Black, Metropolis Gray, Ion Silver, Cosmopolitan Red, Astral Blue and Skyline Blue. Interior color choices include gray and beige in cloth or leather seating configurations and an additional Blue Pearl option for leather seats. Sonata Hybrids equipped with Blue Pearl leather seats will include contrast stitching and trim accent pieces. SAFETY FEATURES2017 Sonata Hybrid comes standard with seven airbags, including a driver’s knee airbag. Electronic Stability Control, Vehicle Stability Management, Traction Control, ABS and a Tire Pressure Monitoring System with individual tire pressure display and a rearview camera are also standard. Projector headlamps are standard while HID headlamps are available. Hyundai engineers implemented many active safety technologies for the Sonata Hybrid to assist drivers and help prevent accidents. No longer reserved for luxury cars, advanced safety technologies such as Forward Collision Warning, Blind Spot Detection with Rear Cross Traffic Alert, Lane Change Assist and a Lane Departure Warning System are all available in this midsize sedan. Sonata Hybrid’s advanced Blind Spot Detection system is designed to alert drivers of an approaching vehicle in the next lane if the turn signal is activated. Drivers are first alerted of a vehicle in the blind spot by warning lights in the side mirrors. When the turn signal is activated, the Lane Change Assist system determines the closing speed of any vehicle in the adjacent lane to determine if the lane change is safe. If the system determines the vehicle in the other lane is closing too quickly, it sounds an audible alarm to warn the driver that the lane change is unsafe. The Lane Departure Warning System uses a forward-facing camera to recognize lane markers. If the system detects the vehicle is headed outside the lane markers, a warning on the instrument cluster illuminates and an audible sound alerts the driver. Rear Cross-traffic Alert (RCTA) is another feature derived from the Sonata Hybrid’s advanced Blind Spot Detection system. RCTA scans the areas to each side of the Sonata Hybrid when drivers are backing out of parking spaces. If the system detects another vehicle is approaching from the side, the Sonata driver is given an audible alert. This system is another tool that helps Sonata drivers utilize active safety technologies. CONVENIENCE TECHNOLOGYThe Sonata Hybrid delivers the convenience technology one would expect in a luxury vehicle in an incredibly efficient mid-size hybrid sedan. Hyundai’s Hands-free Smart Trunk is available on the Hybrid as well as an electronic parking brake with automatic vehicle hold, an Integrated Memory System for driver’s seat and side mirrors, segment-exclusive rear window sunshades, ventilated front seats, power front seats with adjustable driver lumbar support and Smart Cruise Control featuring stop/start capability. MULTIMEDIASonata Hybrid receives a number of audio and multimedia enhancements for 2017, including a larger seven-inch color touchscreen with display audio, standard HD radio, Apple CarPlay, Android Auto and next-generation Blue Link Connected Care. All 2017 Sonata Hybrids come standard with iPod®/USB and auxiliary input jacks, SiriusXM® satellite radio and Bluetooth® phone connectivity with phonebook transfer and voice-recognition. Available upgrades include an eight-inch navigation system and nine-speaker Infinity® premium audio system with subwoofer and external Infinity amplifier. Hyundai’s eight-inch navigation system offers a larger display, a map and music split-screen display and the ability to record SiriusXM presets 1-6. Switching to a preset station in the middle of your favorite song won’t be an annoyance any longer. Rewind up to 22 minutes to listen to the full song or catch up on a sports broadcast. SiriusXM Travel Link® provides access to traffic information, sports scores, weather, stock prices, fuel prices and local movie times. FOUNTAIN VALLEY, Calif. Sept. 12, 2016 – The 2017 Hyundai Sonata Plug-in Hybrid Electric Vehicle (PHEV) offers a class-leading estimated 27 miles of all-electric range and can recharge in less than three hours with a Level-Two charger. It offers the best of both worlds by providing the power delivery of a hybrid gasoline engine, perfect for long trips, with the additional benefit of environmentally friendly all-electric range for commuting. As a result, many consumers will be able to complete their daily commute without using a single drop of fuel, and total estimated range is an impressive 590 miles. The 2017 Sonata Plug-in Hybrid receives a new exterior color palette early in the 2017 calendar year. It is built at the Asan, South Korea plant and is available now at Hyundai dealers. PLUG-IN POWERTRAINAlthough the Sonata Plug-in Hybrid is very technologically advanced, it drives similarly to the regular Sonata Hybrid, but with the additional benefit of extended all-electric range. 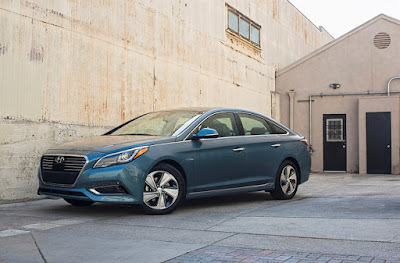 A 9.8 kWh lithium-ion polymer battery pack, more than five times larger than the Sonata Hybrid’s battery, gives the Sonata Plug-in Hybrid an estimated all-electric range of up to 27 miles, further than any other midsize PHEV sedan. The Sonata Plug-in Hybrid uses a six-speed automatic transmission with Hyundai’s Transmission-Mounted Electrical Device (TMED), a 50 kW electric motor, in place of a torque converter. The 50 kW electric motor is 32 percent more powerful than the motor used the in Sonata Hybrid and allows EV operation at higher engine load and speed. A 2.0-liter Nu four-cylinder GDI engine coupled with the electric motor allows the Sonata Plug-in Hybrid to operate just like the Sonata Hybrid once the onboard battery charge is depleted. Sonata PHEV’s Nu engine produces 154 horsepower and 140 lb. ft. of torque and the total system output is 202 horsepower at 6,000 rpm. Sonata PHEV delivers an estimated 99 MPGe combined when operating in EV mode. In hybrid mode, the Sonata PHEV returns an estimated 39 mpg combined. Recharge time ranges from less than three hours at a 240V Level-Two charging station to less than nine hours using a standard 120V outlet. AERODYNAMIC EXTERIORSonata Plug-in Hybrid uses the same functional design cues as the Sonata Hybrid to improve its drag coefficient to an industry-leading 0.24 as well as provide visual cues to distinguish the hybrid models from other Sonatas. A distinctive instrument cluster provides Sonata Plug-in Hybrid drivers with additional information about the Plug-in Hybrid’s functions. A charge indicator is located on top of the dashboard to make it easy to see the state of charge from outside the vehicle. Early in 2017, Sonata Plug-in will offer an all-new exterior color palette, including: Hyper White, Nocturne Black, Metropolis Gray and Skyline Blue. Interior seating color choices include cloth or leather seating configurations in gray or a Blue Pearl option for leather seats. Sonata Plug-in Hybrids equipped with Blue Pearl leather seats will include contrast stitching and trim accent pieces. BLUE LINK APPOwners can manage and monitor the Sonata Plug-In Hybrid Electric Vehicle remotely via the Blue Link smartphone app. With the app, owners can access real-time data from their Sonata PHEV and perform specific commands like starting the engine and locking doors. Plus, users can search for points of interest using Google with voice or text and have the directions when they start their Sonata Plug-in Hybrid. The most useful feature of the app is managing the car’s charging schedule. Owners are given vehicle charging options that they can select while in the car, but users can also manage them remotely via smartphone. Immediate charge is the simplest option, as charging begins as soon as the Sonata Plug-in Hybrid is plugged in. Individuals that have different electric rates at various times may want to schedule the charge. Users can do that with the new app based on time and date. For example, charging could be set to start at 10 p.m. on Wednesdays and Thursdays on a weekly basis. SAFETY FEATURES2017 Sonata Plug-in Hybrid comes standard with seven airbags, including a driver’s knee airbag. Electronic Stability Control, Vehicle Stability Management, Traction Control, ABS and a Tire Pressure Monitoring System with individual tire pressure display, and a rearview camera are also standard. Projector headlamps are standard while HID Xenon headlamps are available. Hyundai offers many active safety technologies for the Sonata Plug-in Hybrid to assist drivers and help prevent accidents. No longer reserved for luxury cars, advanced safety technologies such as Forward Collision Warning and Lane Departure Warning are also available in this midsize sedan. Sonata Plug-in Hybrid’s standard advanced Blind Spot Detection system is designed to alert drivers of an approaching vehicle in the next lane if the turn signal is activated. Drivers are first alerted of a vehicle in the blind spot by warning lights in the side mirrors. When the turn signal is activated, the Lane Change Assist system determines the closing speed of any vehicle in the adjacent lane to determine if the lane change is safe. If the system determines the vehicle in the other lane is closing too quickly, it sounds an audible alarm to warn the driver that the lane change is unsafe. Rear Cross-traffic Alert (RCTA) is another feature derived from the Sonata Plug-in Hybrid’s advanced Blind Spot Detection system. RCTA scans the areas to each side of the vehicle when drivers are backing out of parking spaces. If the system detects another vehicle is approaching from the side, the Sonata driver is given an audible alert. This system is another tool that helps Sonata drivers utilize the active safety technology. An available Lane Departure Warning System uses a forward-facing camera to recognize lane markers. If the system detects the vehicle is headed outside the lane markers, a warning light on the dashboard illuminates and an audible sound alerts the driver. CONVENIENT TECHNOLOGYThe Sonata Plug-in Hybrid delivers the convenient technology one would expect in a luxury vehicle in an incredibly efficient mid-size hybrid sedan. Hyundai’s Hands-free Smart Trunk is standard on the Sonata Plug-in Hybrid. An electronic parking brake with automatic vehicle hold, Integrated Memory System for driver’s seat and side mirrors, ventilated front seats, power front seats with adjustable driver lumbar support and Smart Cruise Control featuring stop/start capability are all available on Sonata Plug-in Hybrid. MULTIMEDIAAll Sonata Plug-in Hybrids come standard with an eight-inch color touchscreen navigation system with Apple CarPlay® and Android Auto® smartphone integration, iPod®/USB and auxiliary input jacks, SiriusXM® satellite radio and Bluetooth® phone connectivity with phonebook transfer and voice-recognition. Available upgrades include a nine-speaker Infinity premium audio system with subwoofer and external Infinity® amplifier. Hyundai’s eight-inch navigation system offers a map and music split-screen display and the ability to record SiriusXM presets 1-6. Switching to a preset station in the middle of your favorite song won’t be an annoyance any longer. Rewind up to 22 minutes to listen to the full song or catch up on a sports broadcast. SiriusXM Travel Link® provides access to traffic information, sports scores, weather, stock prices, fuel prices and local movie times. All Sonata Plug-in Hybrids will also support “Eyes Free” Siri integration, which allows drivers to perform a variety of functions without taking their eyes off the road.